Jane Adair (formerly Jane Wampler) is a recipient of a Colorado Council on the Arts Fellowship, a Poets & Writers Magazine Writers Exchange Award, and two Pushcart Prize nominations. Her poems appear in such places as Poetry Northwest, Copper Nickel, The Cimarron Review, The Missouri Review, Hanging Loose, Seneca Review, and The Hollins Critic. 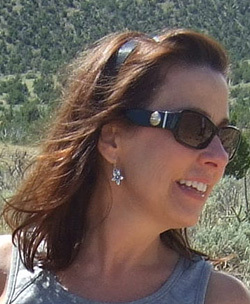 Jane has taught creative writing for the University of Colorado at Colorado Springs and the Colorado College. She has served as president of Poetry West and as a judge for the Colorado Book Award and various poetry chapbook competitions. Her writing has been supported by residencies through Writing by Writer’s The Mill House, Fundación Valparaíso, Ragdale, Jentel, and the Virginia Center for Creative Arts. Jane has been a featured reader in the Denver Poetry Festival, Salt Lake’s City Lights Visiting Writers Series, the Colorado College Visiting Writers Series, Literary Arts Across the Border Reading Series, and numerous other venues in Colorado. She holds an MFA in Poetry from Vermont College of Fine Arts and lives in Colorado Springs with her husband, Leal Lauderbaugh, and their two dogs.